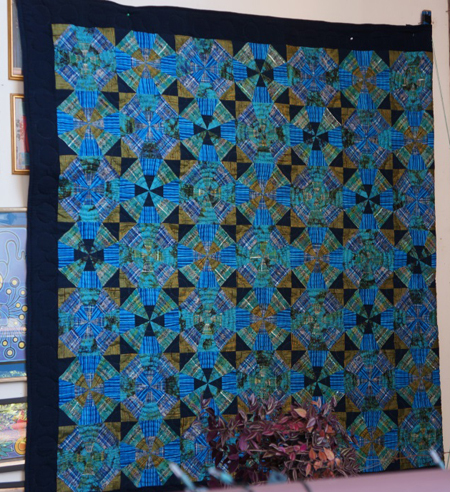 I received these photos of beautiful fabrics and quilts from Linda Teufel, a textile and fashion artist and author – and BERNINA National Artisan – who publishes gorgeous books at Dragon Threads, Ltd. This February my husband and I took a trip to Guatemala for the first time. It was a fascinating country with lots of beautiful craftwork. Of course I was concentrating on the textiles for which they are well-known. 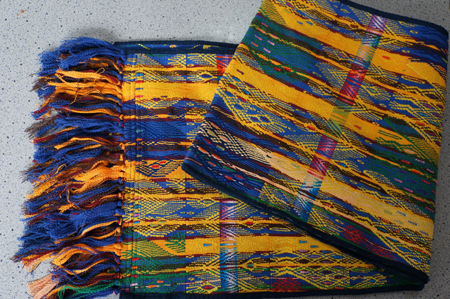 The weavings were exquisite and there are two kinds: machine-made ikat and handmade backstrap loom. This is a piece of ikat that I bought which has many colors and some metallic threads in it. 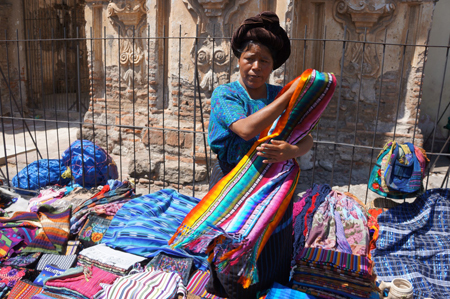 Here you can see a vendor with many examples of ikat patterns. They use the fabric for clothing but also for gift items such as bags, book covers and other souvenir items. 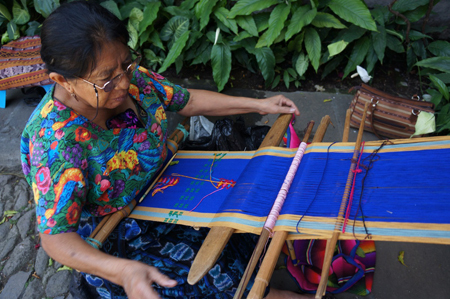 What I was looking for was backstrap weaving and I did see a few women actually working on a loom. 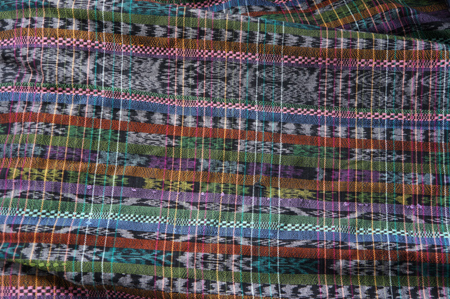 This weaving is thicker and they use it for blouses, belts and table linen. We bought two runners that are very long and have cut off loose threads on the back. The colors weren’t carried across the back to make a neat finish. 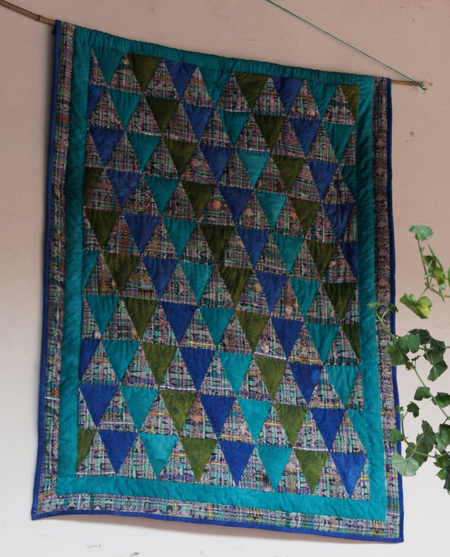 I find that unusual as I don’t think it would use more thread.They are cotton and I think the colors will not bleed but I will soak it in Retayne just to be sure. Many third world countries don’t use colorfast-dyed fibers but I saw a DMC store in the tiniest town so if they use quality thread then it should be fine to wash. 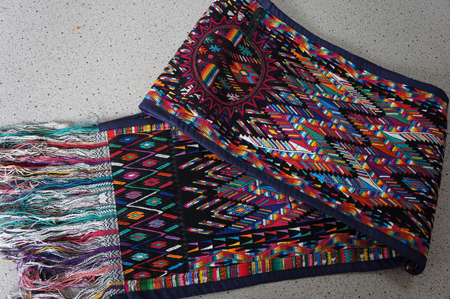 These table runners took hours and hours of work to produce, and my husband literally took the yellow one off the woman’s loom, but the prices they are asking for them are so low, less than $25! If you take a look at the black one, there is a circle in the center. 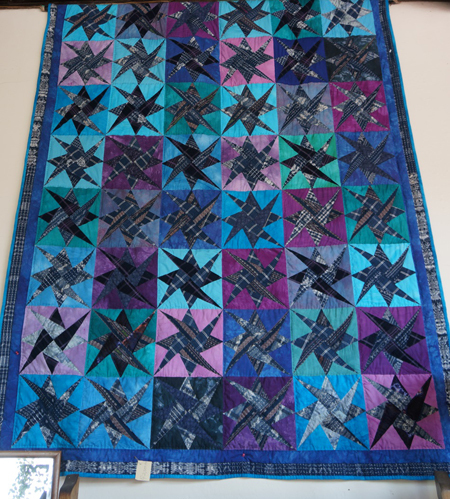 I think it was originally woven for a blouse panel but then stitched together to make a table runner. It is many pieces stitched and serged together. You find this neckhole on many items such as in the center of a pillow cover so I assume everything is woven for clothing primarily. Everywhere we walked, we looked into the open doorways and behind some were beautiful courtyards. This one we discovered in Antigua was quiet with four women selling their wares in the center and here is where we did the majority of our shopping. This also was the only place where I saw patchwork from ikat.